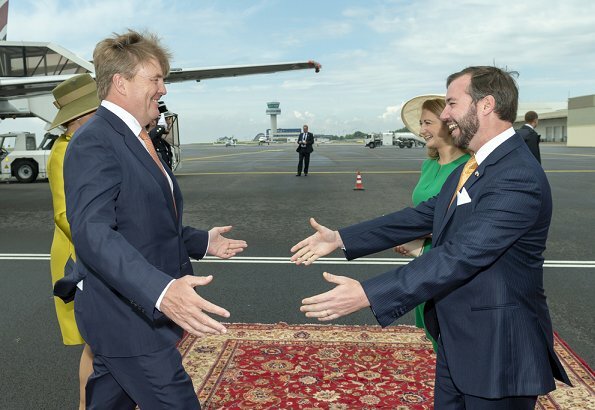 King Willem-Alexander and Queen Máxima of The Netherlands are making a 3 day state visit to Luxembourg upon the invitation of Grand Duke Henri of Luxembourg and Grand Duchess Maria Teresa of Luxembourg. 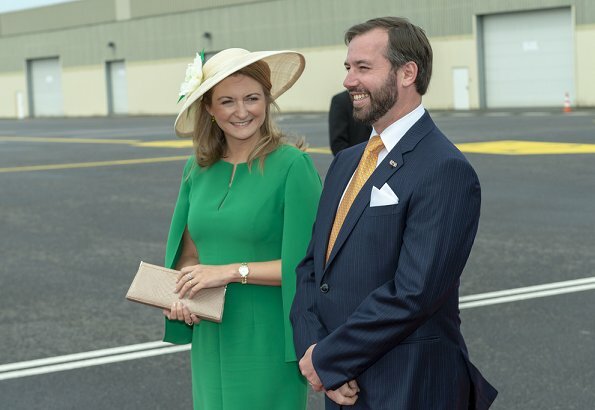 On May 23, King Willem-Alexander and Queen Máxima arrived in Luxembourg and were welcomed by Hereditary Grand Duchess Stéphanie and Hereditary Grand Duke Guillaume at Luxembourg Airport. 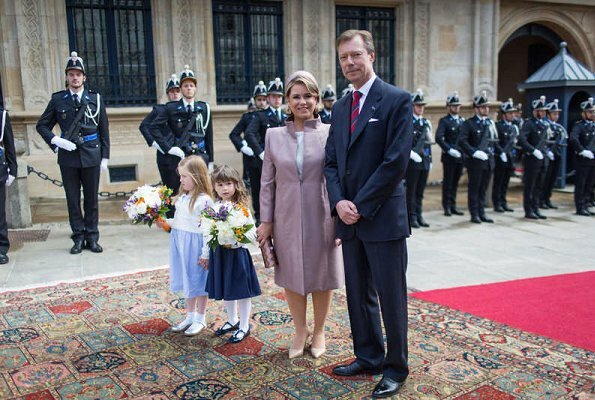 Then, King Willem-Alexander and Queen Máxima were welcomed by Grand Duke Henri and Grand Duchess Maria Teresa with a state ceremony held at the Grand Ducal Palace. 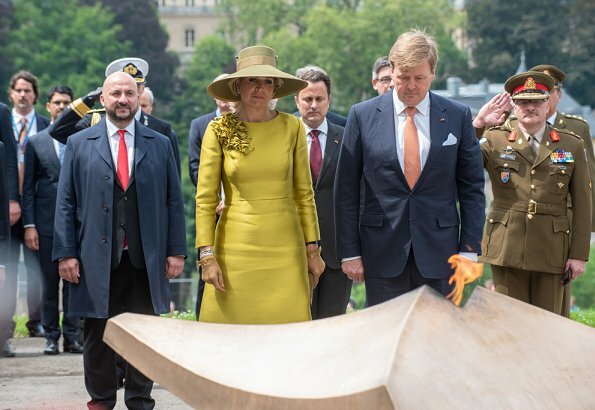 The King and the Queen then placed a wreath on ' Monument de la Solidarité Nationale ' which is the national war monument of Luxembourg. 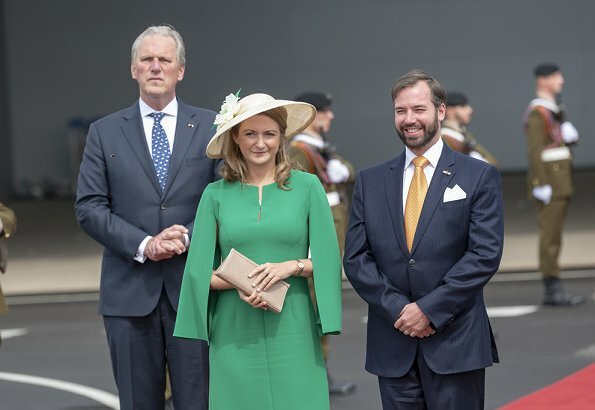 Afterwards, the King and the Queen were received by Mayor of Luxembourg, Lydie Polfer at the municipality building and took a short walk in the city. All the ladies look wonderful here. Maxima, perfect (fit, style colour.. she pulls it all off and more! ); Stephanie - wow.. really happy to see her with this modern style dress and wearing it so well. 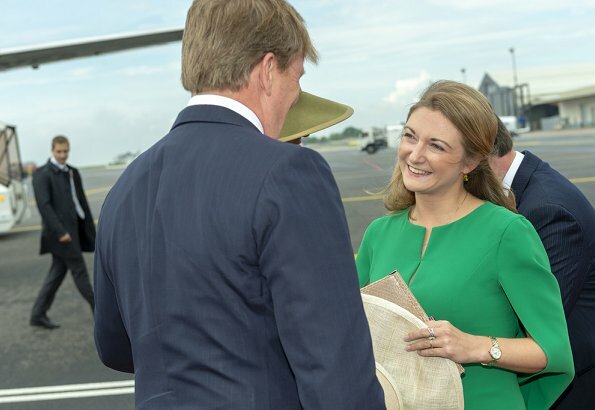 Looks like her hat may have blown off in the wind since she is holding it in her hands and looks a little windswept while talking to Willem; Maria-Teresa is beautiful as always. Well done everyone! They all look lovely. Stephanie's dress is a bit different and I like her hair. Have to admit that I'm dreading some sort of Natan face off!! Francy, they are ALL wearing Natan in these images. What are you dreading then....? Stephanie.. wow! she looks fabulous! 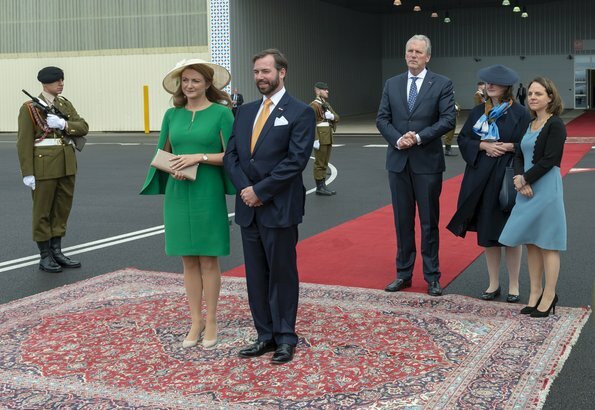 All the ladys look great, I like Maximas dress a lot, but I don't like her hat that time. La Cubana y la Argentina, dos ejemplos perfectos de magnífica belleza y elegancia. All the Ladies look grand daytime wear and gala with all the bling and without. Maria-Teresa is the winner for me, mostly because of the colours of the other ladies dresses. 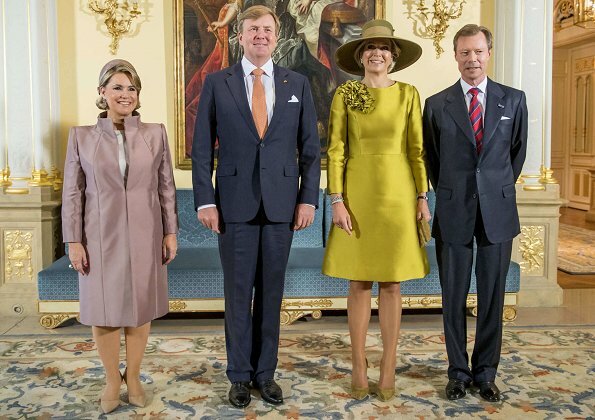 The green does not do any favours to Stephanie, and Maxima's mustard is not my cup of tea. But it suits her very well, and she wears and owns her dress more than any of the other two. Now this is a great look for Stephanie, really has style and flair and is very flattering. 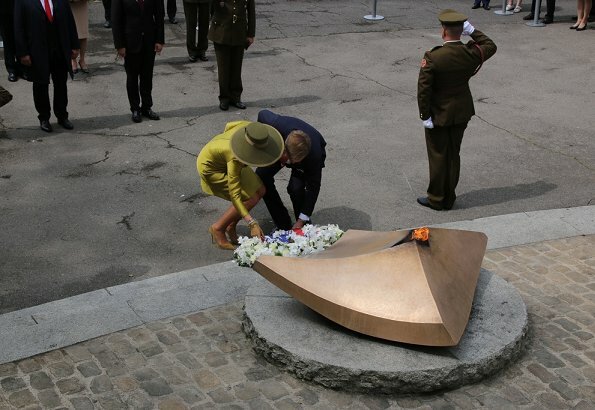 The ribbon on the hat matching the color of the dress is an elegant touch. Agree! Stephanie looks great and love the color! They all look good, but I think especially Stephanie has found an outfit that really suits her. Very nice. They all look very good here. Nice to see friends meeting with joy. Stephanie looks lovely in green. 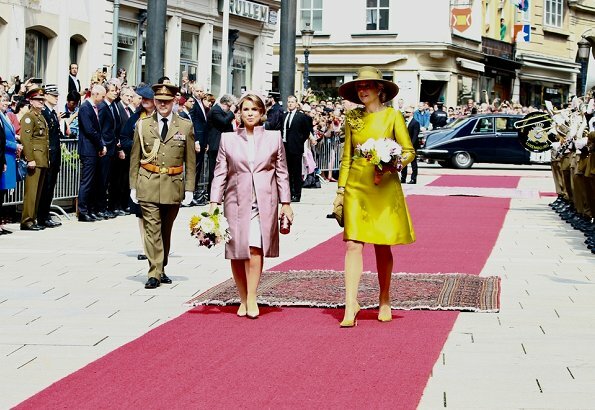 Not sure if I like the colour of Maxima's ensemble or not, however she is beautifully styled and groomed. MT's ensemble leaves me gold.